According to the U.S. Bureau of Labor Statistics, the two most common electrical hazards in industrial environments are electric shock and arc flash. The Electrical Safety Foundation International (ESFI) reports that there were 2,480 non-fatal electrical injuries and 134 electrical fatalities in the United States in 2015. All workers need to be reminded that while Personal Protective Equipment (PPE) is essential, it is the last line of defense in an electrical hazard. The ANSI Z10/CSA Z1000 Occupational Health and Safety risk control hierarchy lists PPE as the least effective safeguard for arc-flash risk. By far the best approach is to design safety into the plant’s electrical system from the start. 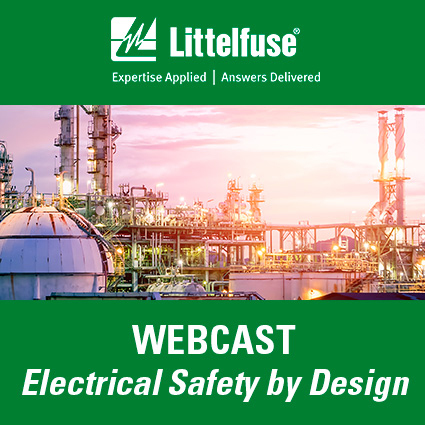 Cost is often an obstacle to implementing engineering controls to mitigate risk, but electrical incidents have a huge impact on a plant’s bottom line both directly and indirectly. OSHA estimates the average electric shock injury costs an employer over $180,000. Furthermore, the American Society of Safety Engineers (ASSE) reports that Liberty Mutual polled executives and learned that for every $1.00 spent on workplace safety, they saw a return of $3.00. Safety is a good investment. Upgrading components such as current-limiting fuses, arc-flash relays, industrial GFCI, and Bluetooth® enabled relays to design in safety need not be expensive and the return on safety investment is well worth it. Workers and business owners need to be reminded that while PPE is essential, it is the last line of defense in an electrical hazard. Even one incident can cost more than the price of the component upgrade, so there is no excuse for not considering it. Working together we can make electric shock and arc-flash injuries in industrial environments, much less common. The best way to reduce risk of injury from electrical hazards is to design in safety from the start. Other Products by Littelfuse, Inc. Correctly selecting fuses and protection relays is essential for minimizing risk to personal and equipment. Littelfuse University’s catalog of award-winning courses can help you choose the right products for your applications. Plus, you can access our broad range of training videos easily from your desktop, tablet or smart phone. Go to Littelfuse University and sign-up today. There is an easy way to determine the product that best fits your needs. Our online guide helps you navigate through our 225 relay product series and find the right relay for your application. Keep Your Distance and Stay Safe! Introducing the Revolutionary New MP8000 Bluetooth® Overload Relay. This smart, universal relay can communicate directly with your smart phone via Bluetooth®. No need to open the control panel. Monitor and control unlimited relays through the Littelfuse App on the smartphone you already own from a safe distance. New DIN Releasable Fuse Blocks available from Littelfuse save installation time and effort. These blocks mount securely to standard 35mm “hat” DIN rails without extra adapters. The spring-free release mechanism allows for individual block installation and replacement without removing adjacent components. Configurations are available for Class CC, Class G, and Midget fuses. More than 225,000 electrical professionals use ElectricSmarts to access our eCatalog of 2 million plus products, the latest new product information, videos, spec sheets and more.